Screen 1. 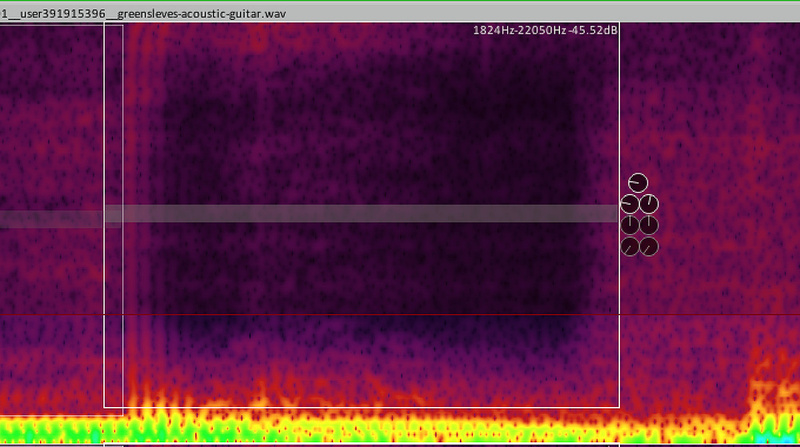 A picked acoustic guitar part with the default Peaks Display Settings for the Spectrogram view. Notice the vertical lines that show individual notes, and the ‘smearing’ that is a finger-scrape or fretboard squeak. We help you get to grips with Reaper’s new spectral-editing functions. Before you can start editing, you need to understand what the new Spectrogram view is telling you. We’re all familiar with the usual Peaks waveform, which plots level (‘Y’ axis) against time (‘X’ axis). It doesn’t tell us anything about frequency, though — for that most people fire up a frequency analyser plug-in. The Spectrogram view displays frequencies on the ‘Y’ axis and time on the ‘X’ axis, but with the level at different frequencies indicated by colour. With experience, it’s really easy to spot distinct sounds in the Spectrogram — the squeak of fingers on a fretboard, for example, or manuscript page turns. 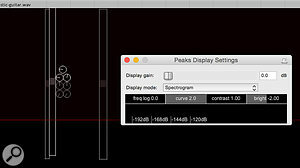 Whichever approach you choose, you’ll want to use the Peaks Display Settings to customise the Spectrogram view (Screen 1). 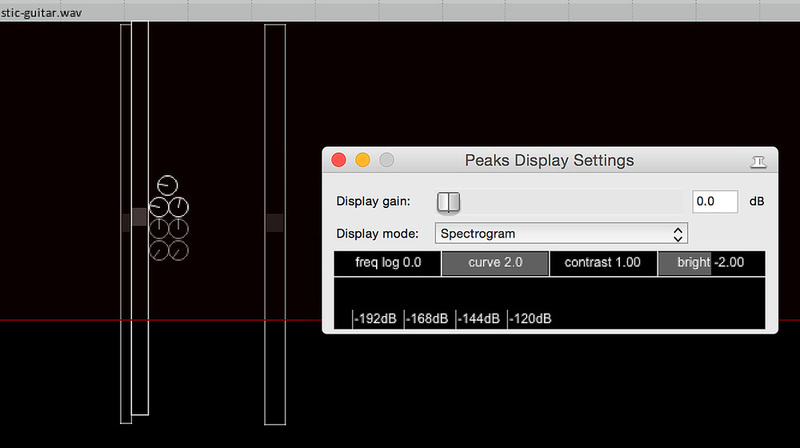 This window features a drop-down menu where you can choose the desired display: Peaks, Spectral Peaks, Spectrogram (and some combinations). The Display Gain is used to increase the size of the waveform — it’s useful when analysing quiet sources, but note that this global setting applies to the Peaks view as well as the Spectrogram, so it’s worth assigning a shortcut key to access this window. Often useful in Spectrogram view is the ‘freq log’ parameter, and increasing this from the default value of zero has the effect of zooming in on the lower parts of the frequency spectrum (Screen2). At the bottom of the window, you can drag the coloured bar to change the colours used on the Spectrogram display. This sets the broad colour scheme, and then the ‘curve’ parameter governs the intensity of that scheme — reducing the default setting (maximum) makes louder and quieter frequencies appear less differentiated. Typically, I leave this at the default, but I’ve sometimes found it useful to juggle the settings of this and those of the contrast and brightness controls — while the resulting appearance is perhaps technically less precise, it can help to reveal certain sounds more clearly at lower zoom settings. To understand what I mean, try reducing the curve parameter and brightness considerably but increasing the contrast — notice both the change of the Spectrogram display itself and in the colour scale at the bottom of the Peaks Display Settings window. It’s perhaps not the most intuitive system, but it’s possible to fine-tune the colour scheme considerably. Note that the Spectrogram displays the frequency/level information post any clip processing (such as reverse and pitch changes), but pre any effects processing (whether they be Clip FX or channel inserts). Screen 2. The same part, but with adjustments to the Spectrogram made via the Peaks Display Settings window, to emphasise the problem area. OK, enough about appearances — let’s work through an example to help you get your bearings. The screens show a short acoustic guitar recording (from the excellent resource freesound.org — it has a Creative Commons license, and you can grab it here if you want to follow the example: https://freesound.org/s/389401). We’ll use Reaper’s spectral editing to make the finger/fretboard scrapes intrude a little less on the music. The first step, of course, is to play the part back and listen for problems. Locate an offending scrape and zoom in on the Spectrogram so you can see what’s going on. As you can see from the screenshots, the onset of each note is visible as a vertical line, but there are also some areas where you can see a few vertical lines, with a bit more mid/high-frequency information following them — these are the finger scrapes, which you’ll soon learn to recognise. Zoom in fairly close on one of those, and make a selection (I have Reaper set up to make a selection by right-click-dragging, which makes this really easy). Right-click on your selection and from the ‘Spectral edits’ menu, select ‘Add spectral edit to item’. A translucent box will appear, accompanied by a number of small knobs. The box is your ‘Spectral edit’. It determines which frequencies and time selection will be affected by your spectral editing. The knobs govern the actions that can be performed. Despite these being somewhat limited in scope (you can’t apply effects, for example, or cut certain frequencies to paste them on another track) you can still achieve quite a lot. First, we’re going to simply turn down the offending frequencies. 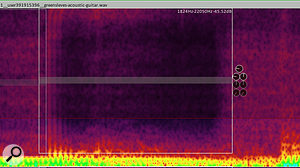 By default, the box occupies the full height of the Spectrogram so that all frequencies are affected. To adjust this, drag up from the bottom of the box (it’s possible to drag down the top but it’s all too easy to grab other parameters such as the clip volume!). Then grab the line across the middle of the box to move it. With the top and bottom lines of your selection box now visible, it’s easy to refine the selection. One frustration at the time of writing (Reaper 5.52; hopefully it will have been addressed by the time you read this) is that there seems to be a glitch in the ‘X’ axis selection. You need Snap disabled, of course, but even then I’ve found that the box can suddenly grow when trying to make horizontal adjustments to the selection, and it can’t be shrunk again. This seems to be related to the ‘Take processor FFT size’ setting, because to shrink it, my workaround is to change that setting, reduce the box size as desired, and then change the setting back. Screen 3. I added a Spectral Edit via the right-click menu, and then used the Spectral Region Gain to reduce the level of the scratch, before using the Spectral Region Time Fade, and Spectral Region Frequency Fade knobs to make the edit less intrusive. Once you’ve made your selection, use the uppermost knob (‘Spectral region gain’) to attenuate the scrape sound. If it helps, go further than sounds good so that it’s more obvious that you’re removing the right frequencies. Then back off the attenuation until it sounds in the right ballpark. The boxes aren’t the most precise means of selection, and you’ll need to finesse the result using the pair of knobs immediately beneath the gain. Try the left one (Spectral Region Time Fade) first. As you increase this, you should see the Spectrogram information change — it’s crossfading into and out of your spectral edit, to make the results sound smoother (Screen 3). By adjusting this setting and the width of the edit box, you can target the offending sounds relatively unobtrusively. The right knob does the same thing but on the vertical axis, crossfading between the frequencies inside the box and those outside it. In this acoustic guitar example, I found this control essential to get my edits sounding reasonably transparent — I dragged and placed the box slightly lower than I had done when initially selecting the scrape, and then increased this setting to create a gentle fade that didn’t draw attention to itself. If you lose track of your spectral edits when zooming in and out, just reduce the brightness to reveal them!It can be a bit painstaking going through a part to refine every bang and scrape, but if you listen through the results a few times and refine your edits according to what you hear, it will soon become easier — and it can work very well. The trick in this instance was to allow enough of the lower frequencies through that the edit didn’t stick out like a sore thumb, and then to use the time/frequency fades to refine the result. Don’t be scared to experiment though — spectral editing is not a destructive process; if you disappear too far down the rabbit hole, you can delete any spectral edit via the right-click menu! This is just one example to get you started. You’ll want to experiment with the gate and compressor knobs (I don’t have the space to cover them here). And note that different problems and different material may require a very different approach. For example, it’s not a problem to hear a little fretboard squeak in a guitar part, so you might just want to attenuate it, but if a dialogue part for a period drama includes the sound of an aeroplane captured via the rear lobe of a shotgun mic, you’ll want no trace of the plane left behind! In that particular case, I’d suggest using a more capable spectral editor like RX6, but you can add as many of Reaper’s spectral edits as you wish, and it’s possible to get quite surgical by using lots of small edits. Having this facility in the project window really is welcome — and I can’t wait to see what new features are added to Reaper’s spectral editing in future updates.